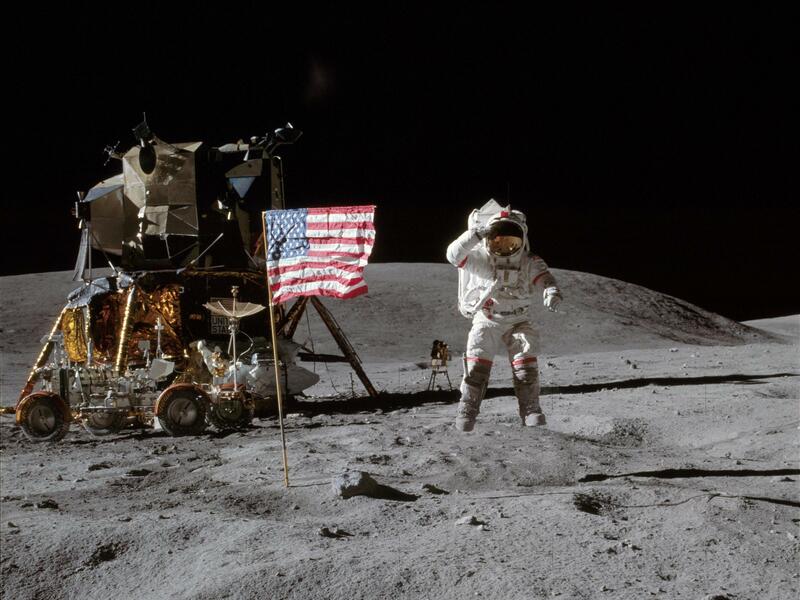 On the moon in 1972, Apollo 16 astronaut John Young jumps off of the lunar surface to salute the U.S. flag. Astronaut John Young, co-pilot of NASA's Gemini 3, inspecting his space suit. He was the only astronaut to fly Gemini, Apollo and shuttle missions. Astronauts John Young (left) and Bob Crippen, the crew of the first space shuttle mission, hold a model of the spacecraft. Young died Friday at age 87. "If anybody deserves the title of legend it would be John Young," said Andrew Chaikin, an author who has written extensively on NASA. He said Young, a former Navy test pilot, was special. He was co-pilot on the first Gemini mission in 1965 and then commanded a Gemini flight the next year and orbited the moon on Apollo 10. In 1972, Young went on to command Apollo 16, and apparently all his experience hadn't made him blasé about space travel. Just minutes after landing on the lunar surface, he peered out the window and was at a loss for words: "Houston, uh, boy. I can see Ray Crater from here. Boy!" said Young. Chaikin says Young's NASA career up to that point — culminating with a moon landing — had been impressive. "You know that alone would have qualified him for being in the Hall of Fame of astronaut careers," Chaikin said, "But the thing that really made him a true legend was in 1981 when he commanded the very first space shuttle mission." That mission in 1981 was the first time NASA sent a vehicle into space with people on board without a prior unmanned launch. Young said later that launching the space shuttle always scared him more than it thrilled him because so much could go wrong. Young was an aeronautical engineer who later in his NASA career served as the chief of the astronaut office, choosing those who would fly on the shuttle. He also advised on engineering, operations and safety matters. "He would go into meetings with the specialists for a particular system and he would say in this kind of country-boy way, 'Well, you know, I don't understand much about the such and such but what gets me is...' and then he would proceed to ask just a completely penetrating technical question that would just, you know, flatten these people," said Chaikin. Young avoided the limelight but was outspoken and known for writing hundreds of memos pointing out safety flaws and operational concerns. In his autobiography, he said he felt responsible for the loss of the shuttles Columbia and Challenger because his crews were on board. He wrestled with how the agency could have missed the warning signs. "I mean, it's pretty obvious. You don't have to be a rocket scientist to figure this out. If you look at the inevitable consequences and you look at our technologies that we need to make it, you'd come to the same conclusion, and you know, it's doesn't take a lot of thinking, but somebody ought to be worried about it." He told NPR he never imagined NASA would stop the lunar missions in the 1970s and not send humans to explore the universe. "No, I figured we'd be up there forever, and we'd keep right on going and set up bases on the moon and use it for all the benefits that we could get from it, which is plenty of them," Young said. When he retired from NASA in 2004, he'd been with the agency for 42 years — the longest serving astronaut. We want to take a moment now to remember John Young, NASA's longest-serving astronaut. 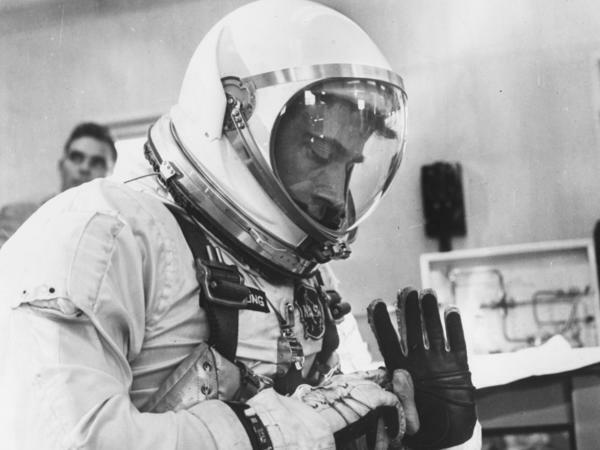 His career at NASA was filled with firsts, including being the first to fly in space six times. Young was also 1 of 12 people to walk on the moon. Today, he died at the age of 87. NPR's Russell Lewis has this remembrance. RUSSELL LEWIS, BYLINE: When it came to John Young, there were many superlatives. ANDREW CHAIKIN: If anybody deserves the title of legend, it would be John Young. LEWIS: That's Andrew Chaikin, a space expert who has written extensively on NASA. He said John Young was special. He was co-pilot on the first Gemini mission in 1965 and then commanded a Gemini flight the next year and orbited the moon on Apollo 10. And then, in 1972, he commanded Apollo 16. Just minutes after landing on the lunar surface, he peered out the window and was at a loss for words. CHAIKIN: You can - boy, I can see Ray Crater from here - boy. LEWIS: Chaikin says Young's NASA career up to that point, culminating with a moon landing, had been impressive. CHAIKIN: You know, that alone would have qualified him for being in the Hall of Fame of astronaut careers. But the thing that really made him a true legend was in 1981, when he commanded the very first space shuttle mission. UNIDENTIFIED MAN: Columbia, Houston, you're go at throttle up. JOHN YOUNG: Roger, go at throttle up. LEWIS: Young was an aeronautical engineer who later in his NASA career served as the chief of the Astronaut Office, choosing those who would fly on the shuttle. He also advised on engineering, operations and safety matters. Chaikin says Young was a force at the space agency. CHAIKIN: He would go into meetings with the specialists for a particular system. And he would say in this kind of country boy way, well, you know what, I don't understand much about the such and such but what gets me is - and then he would proceed to ask a - just a completely penetrating technical question that would just, you know, flatten these people. LEWIS: Young avoided the limelight but was outspoken and known for writing hundreds of memos pointing out safety flaws and operational concerns. In his autobiography, he said he felt responsible for the loss of the shuttles Columbia and Challenger because his crews were on board. He wrestled with how the agency could have missed the signs. In a 2004 NPR interview, Young said the future of the human race's survival is not on Earth but in space. YOUNG: I mean, it's pretty obvious. You don't have to be a rocket scientist to figure this out. If you look at the inevitable consequences and you look at our technologies that we need to make it, you'd come to the same conclusion. And, you know, it's going to take a lot of thinking but, you know, somebody ought to be worried about it. 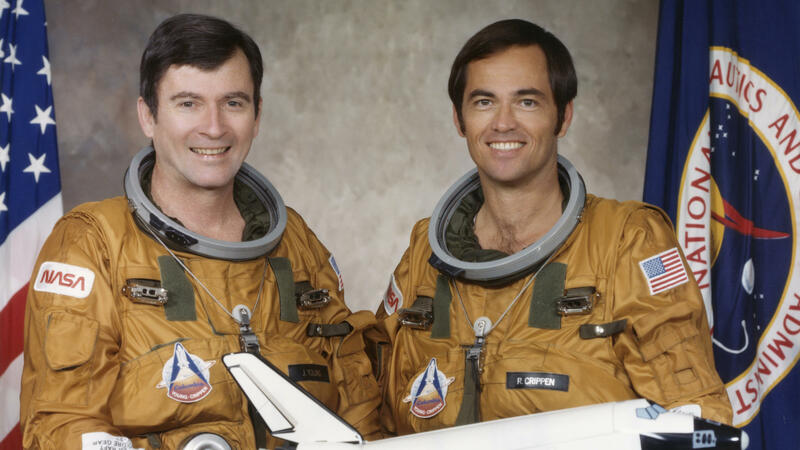 LEWIS: John Young, Navy test pilot, six-time astronaut and 42-year veteran of NASA. Russell Lewis, NPR News. (SOUNDBITE OF MESSAGE TO BEARS' "FAREWELL, STARS") Transcript provided by NPR, Copyright NPR.